According to my parents, I was a big Tweety Bird fan when I was little. Which I guess explains a hazy memory of a battered old plastic kids mug from Six Flags at home in NC, and why my mom got me a vintage stuffed Tweety for me to keep here in NY. And, why I picked up this little guy - though I can't remember where from - Warners? Six Flags? Eh, who knows. But, I'm picking this one for today's magnet, because on the many occasions when I'm wrong about things I've soapboxed before, I like to admit it. Usually with a caveat or two, of course. So, here's what I was wrong about. Twitter. Or rather Celebretweeting. Exactly one month ago, I sat here on joy magnetism and reviled the Twitterverse. But, because people and the press can't stop talking about it, I've been delving back into it for the past month, to see if perhaps it's changed since last year. And, it has, somewhat. I still don't like Tweeting my own statuses - I have two accounts on Facebook for that. 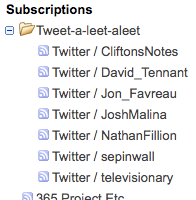 But, how awesome is it that I can just RSS feed Twitterfeeds right into my Google Reader, which means, I never have to visit the twitter.com site. Which is just happy-making. And, next, in a complete 180 from a month ago, I've discovered that don't really want to follow people I actually know. It's more fun to follow celebrities and my two favorite critics. Odd, right? Particularly since I'm the one who totally didn't "care about their break-ups or opinions." And, I still don't, for the most part. But, what I've found, are that there are a select few folks who are actually entertaining - the ones who are just naturally amusing. And, as long as they don't tell me that they're tweeting from the john, then they really are just providing another source of entertainment for me. Also odd, I know, are my choices for celebrities to follow - because it's not like I'm really huge fans of theirs, really. Jon Favreau is there for the Iron Man tweets - there's something fun about knowing that Nick Fury's on set. Or, that they're working long into the night with two camera units. David Tennant even though I know it's not him, but sometimes it's really funny to watch David Tennant stalking his own tv shoots. Heh. Mind you, I still worry about where all this celebretweeting will lead. I have this whole issue about soap stars allowing too much access through their personal appearances and charity events, where they're becoming too chummy with their fans. And then, they turn around and worry about their own privacy. Dude, you drank and broke bread with them - once that line's been crossed, it's hard to resurrect it. But, now that it's so easy for fans to reply to a celebretweet, that's kinda scary. So, I wonder if the fact that celebs can interact so much with their fans through this (and Facebook and other SNS outlets) will cause people in real life to cross the line, down the line. But for now, as I said, these guys are just providing another form of pure entertainment for me. And as long as it stays that way, then I can get with the celebretwitterverse. 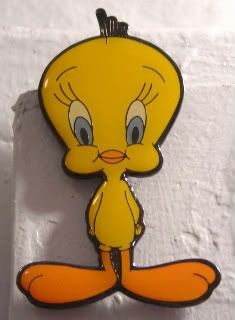 Apropos to nothing...have ya'll ever noticed that Tweety Bird's feet are the size of Big Bird's feet? Weird!